Have you ever wondered why we Scots are always speaking about the weather? Last week Aberdeen was the warmest place in the UK one day, with temperatures in the mid teens C, the following day it was -4C and we were close to the coldest, the next day we had about 7 -8 cms of snow which lasted for about three days before the temperature rose and we had rain. 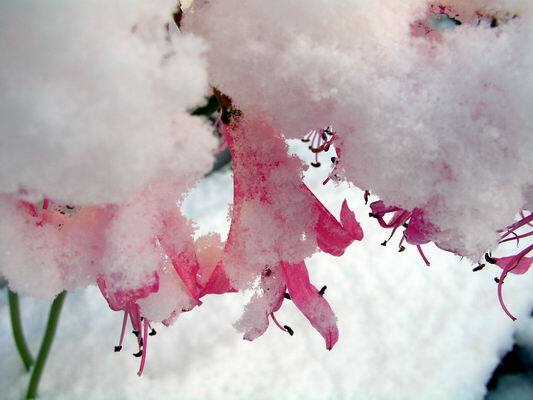 The Nerine bowdenii looks very attractive covered in snow and I suspect that it will get that occasionally in Northern Natal, in the Drakensberg where it grows. The flowers were starting to go over but were none the worse after spending some days in freezing conditions. 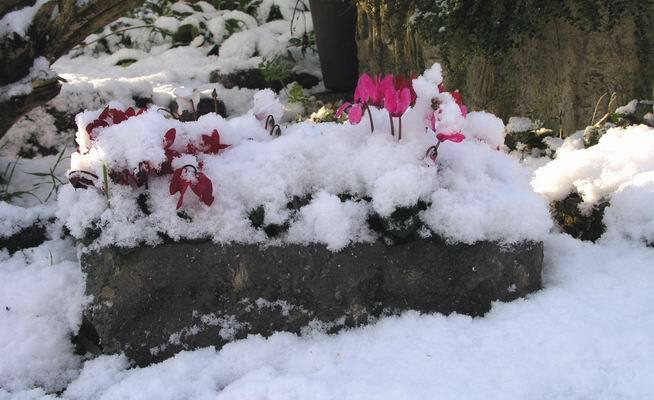 The small fish box trough that I planted up with Cyclamen persicum cultivars was also outside, taking the elements without any harm. It certainly makes for a nice picture. When you are taking pictures in the snow you should adjust your exposure meter to at least +1 stop to prevent the snow from looking grey. 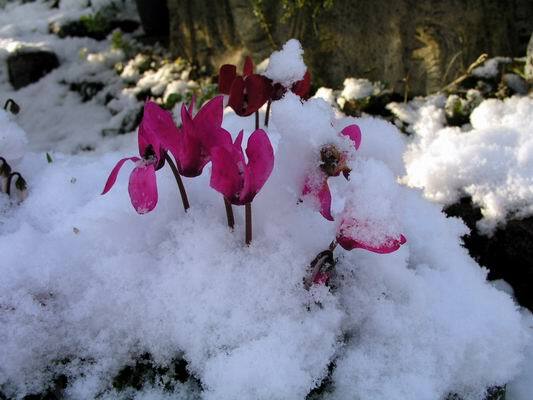 Later I did move the Cyclamen into the bulb house as I do not think that their corms could take too much prolonged freezing especially when they are wet as well. 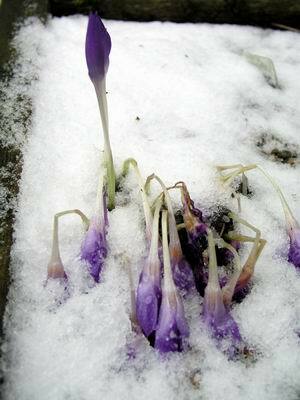 These Crocus banaticus did not fare so well in the snow. It is not so much that the cold that does for them, but the weight of the snow that bashes them down; driving wind and rain will do the same thing. This is the same clump in bud a few days before; I missed out getting a picture of them on the mild day when they were all open and looking fabulous. Mid November is quite late for our first snow so we should not complain. 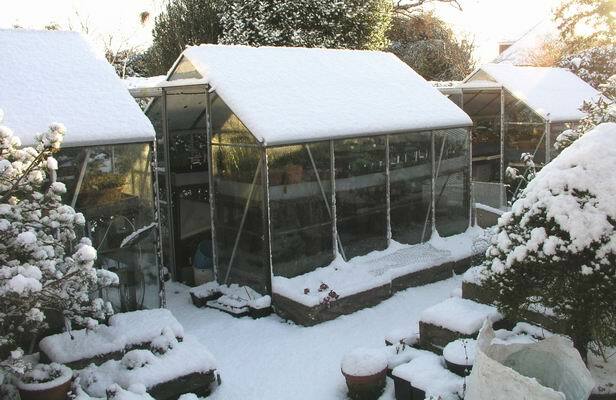 The bulb houses provide the protection from the physical battering that the weather brings so we are still enjoying some Crocus species that will flower through the winter. 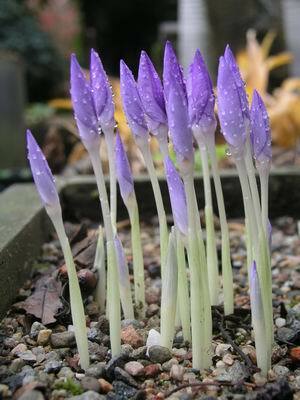 Our pot of Crocus laevigatus just goes on and on, when one lot of flowers goes over another appears. 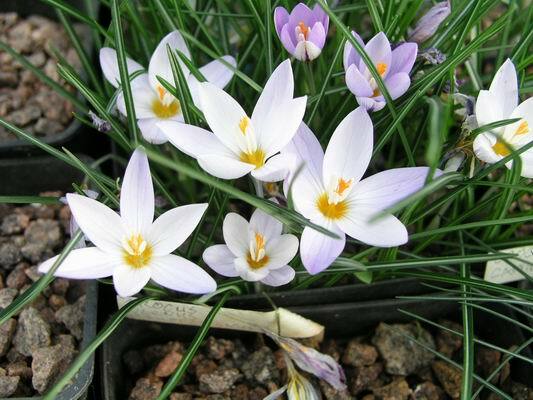 This is largely because we have pots full of mixed clones raised from seed and the flowering period for Crocus laevigatus is any time from September, when the very early forms appear, through to February with the late comers . 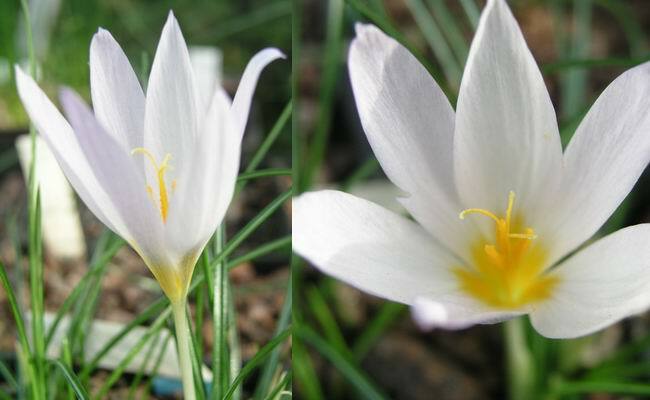 Crocus caspius has also got a few new flowers which are weeks behind the first of this species to flower; pictured in log 40. Above is a nice fat healthy pot full of Crocus mathewii seedlings sown in 2003. I hope that the first of these will flower next year. One of the great joys of gardening is when the postie delivers a packet full of bulb seeds from a friend. I first prepare all the labels with the plant name, date of sowing, numbers and any other relevant details all engraved on an aluminium label made from old venetian blinds (see Log 38 2003). 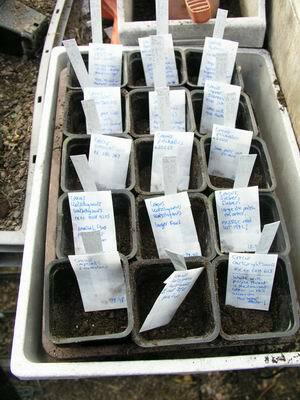 Then, as these are Crocus seeds, I fill the pots to about one third depth and place the labels and the seed packet in. Then I sow the seed double checking the labels against the packets to make sure the match up, before filling the pot with compost and topping off with a 1cm layer of 6mm gravel. 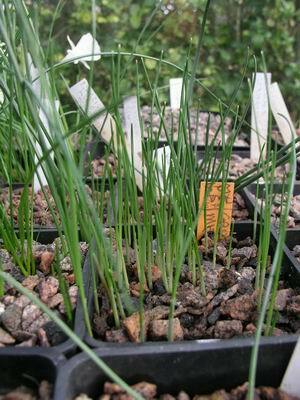 The SRGC 2004-2005 Seed distribution List is now out with 4333 listings of seed including many bulbous subjects. My thanks to all the volunteers who perform the huge task of receiving, packeting and distributing the seed donated by Members. This year sees the introduction of an on-line ordering system which is the first of its kind among the Rock Garden and Alpine Clubs and Societies. 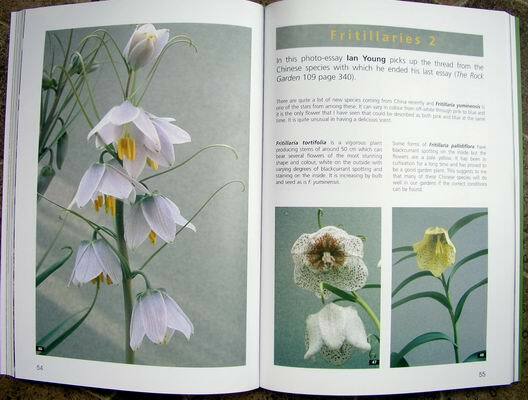 This seed exchange is only open to SRGC Members and is only one of the benefits of SRGC Membership as you also get our highly acclaimed, twice yearly publication 'The Rock Garden' the most recent of which had the second part of my Fritillaria photo essays in. 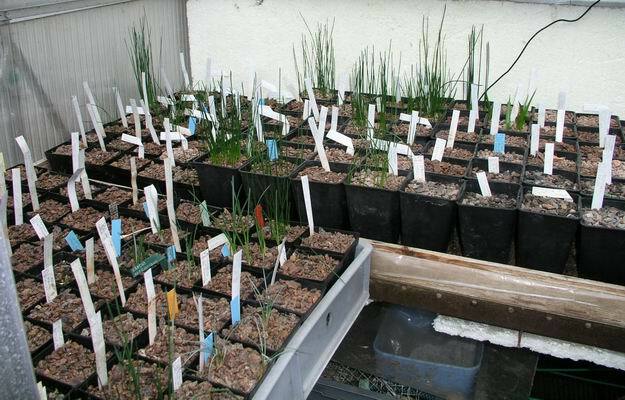 Sorry for the blatant advertising but I know that many bulb loggers are not SRGC Members and I want you to know what you are missing out on.